Get set for the return of the Clangers Jump to media player Four decades after they first appeared on our TV screens, the pink, knitted, whistling space creatures known as the Clangers are back. 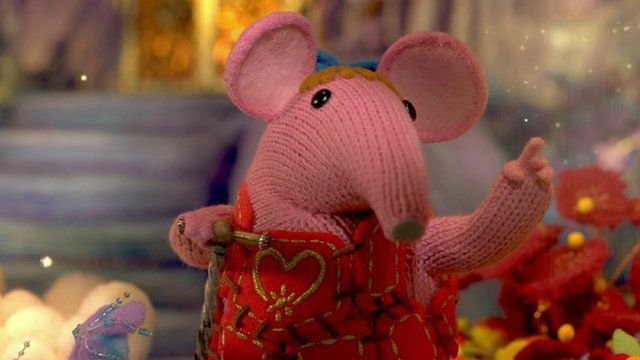 The Clangers to make TV return Jump to media player The popular 1970s children's show, the Clangers, is making a comeback to TV screens, with a new series in production for CBeebies in 2015. Palin 'honoured' to narrate Clangers Jump to media player Actor Michael Palin says he feels "honoured" at being chosen as the new narrator of The Clangers. Shaun the Sheep wins character poll Jump to media player Shaun the Sheep has been voted the nation's favourite children's TV character, beating off rivals such as Postman Pat, Paddington and the Wombles. Danger Mouse makes CBBC comeback Jump to media player One of the original Danger Mouse scriptwriters says he has "mixed feelings" about the cartoon hero's return. Is too much TV bad for children? Jump to media player Watching too much TV does not have a significant impact on children's behaviour, a new British study shows. Is that what parents want to hear? Four decades after they first appeared on our TV screens, the pink, knitted, whistling space creatures known as the Clangers are back. With a new narrator in Michael Palin, the programme has undergone a £5m revamp - in the hope it will charm a whole new generation of children.